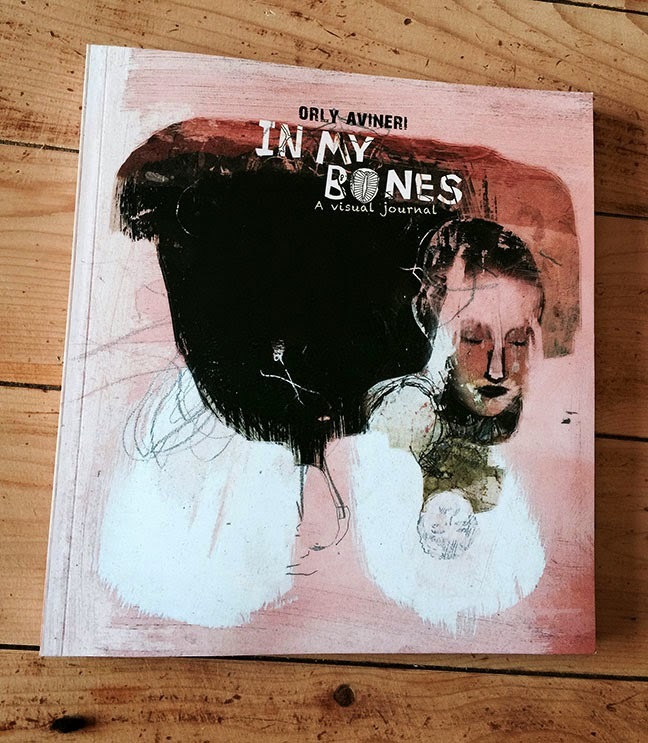 It thrills me to be able to announce that Orly Avineri has just released her third book In My Bones. 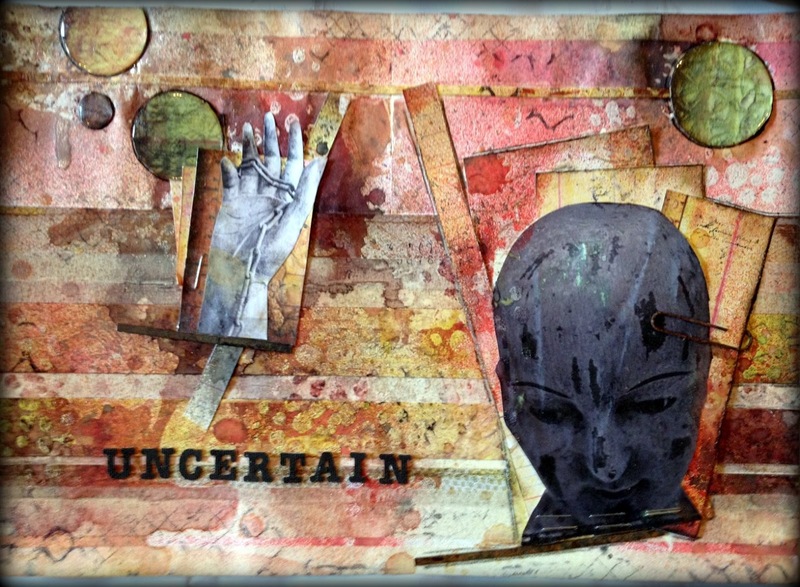 Orly is an artist who expresses herself primarily in the form of visual journaling. Her work is authentic, honest, and raw. Just as she is. Looking at her journal pages is like looking directly into the heart and soul of Orly. And through this book, we all have the privilege of being able to be a part of her journey that is at once so intimate and personal and yet somehow universal. Having seen her journals in person, I can attest to the power of her pages to move the viewer. Every page she makes tells a vivid and compelling story that creates a desire to interpret, to understand, and to know more. One gets the sense that every small detail has meaning and that no mark is random. This is clearly art that Orly feels in her bones. From the book: Orly...opens her visual journal once again to express her belief in the boundlessness that comes from admitting incompleteness and and ambivalence - in the sheer relief that comes from one's willingness to exit the body in order to pour an intimate world onto pages of a visual journal and share it generously. All for the purpose of experiencing gentle journeys back to self and creating a true sense of belonging and connection. 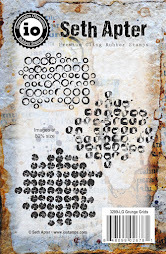 You can see Orly's work, learn more about this book, and purchase it by heading to her blog One Artist Journal. 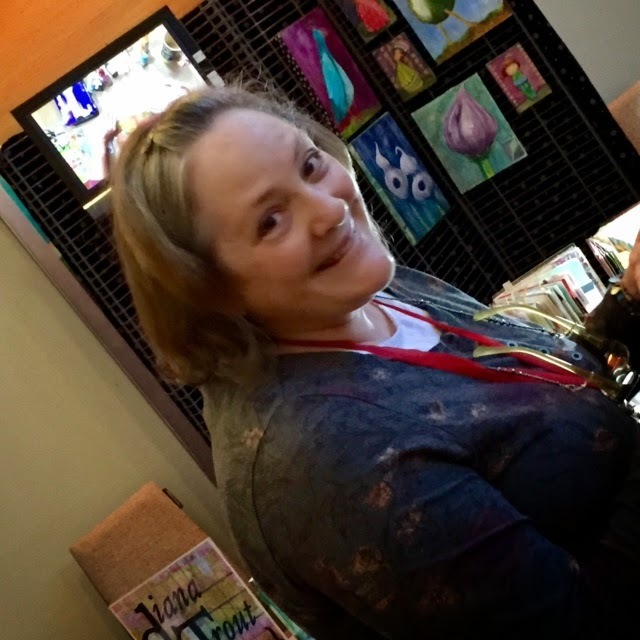 Details about all three of her books, including One Artist Journal and 14 Artist Journals, are available here. And you can connect with Orly directly on her Facebook page. Congratulations Orly. Thank you for opening the door and inviting us all inside. 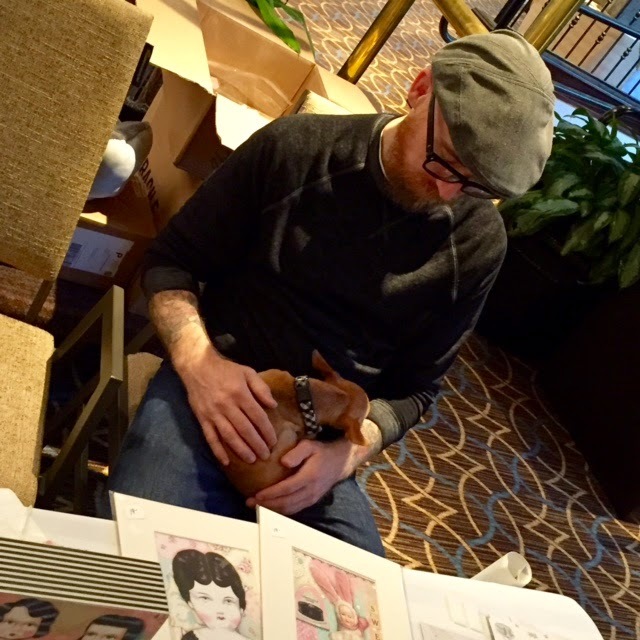 There is a column in every issue of Cloth Paper Scissors magazine called Artists Give Back. 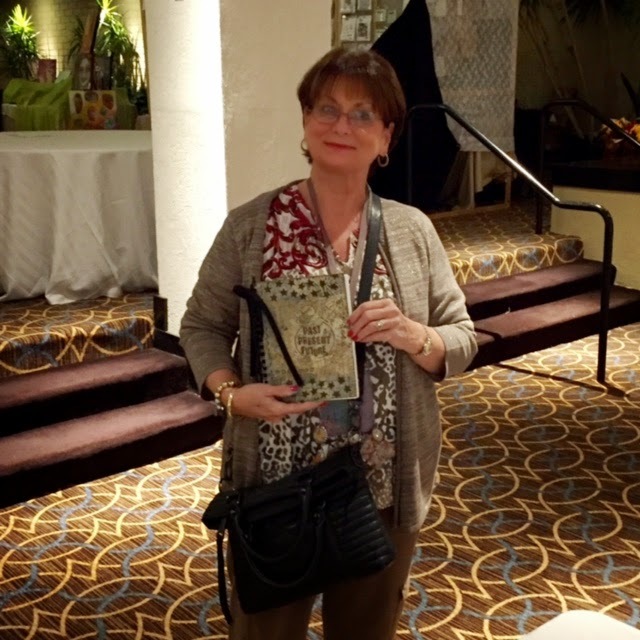 it is written by Elena Lai Etcheverry, who herself knows a lot about giving back. 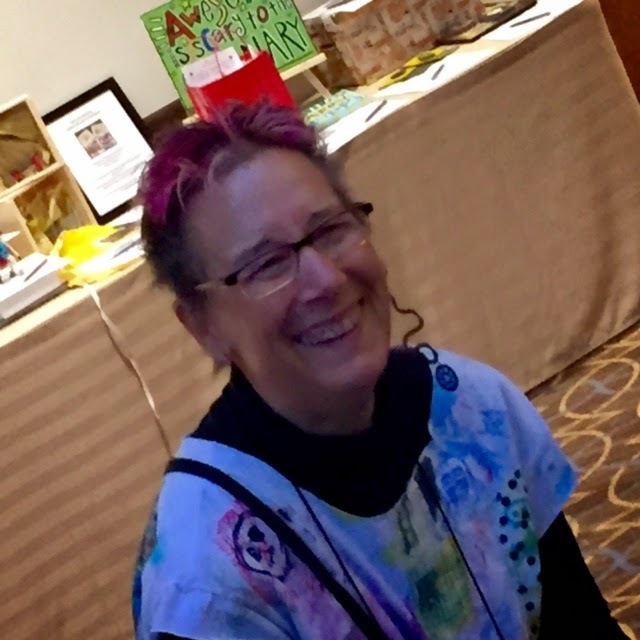 Elena is the Founder and Executive Director of Charity Wings, an art & craft center in San Marcos, California that is dedicated to the charitable and healing aspects of art. 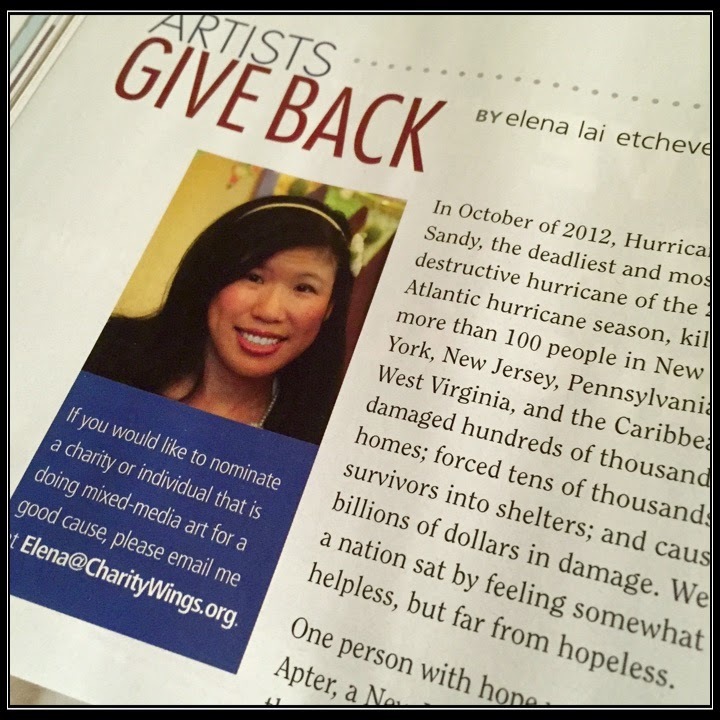 In the new, November/December issue of CPS, Elena has chosen to write about The Pulse Charity Auction that I spearheaded in response to Hurricane Sandy in 2012. Nearly 50 art-related items were donated by artists and more than $2,300 was raised and donated to the victims of Sandy. You can read more about the event in this blog post and on the pages (well, page 24 to be exact) of CPS. 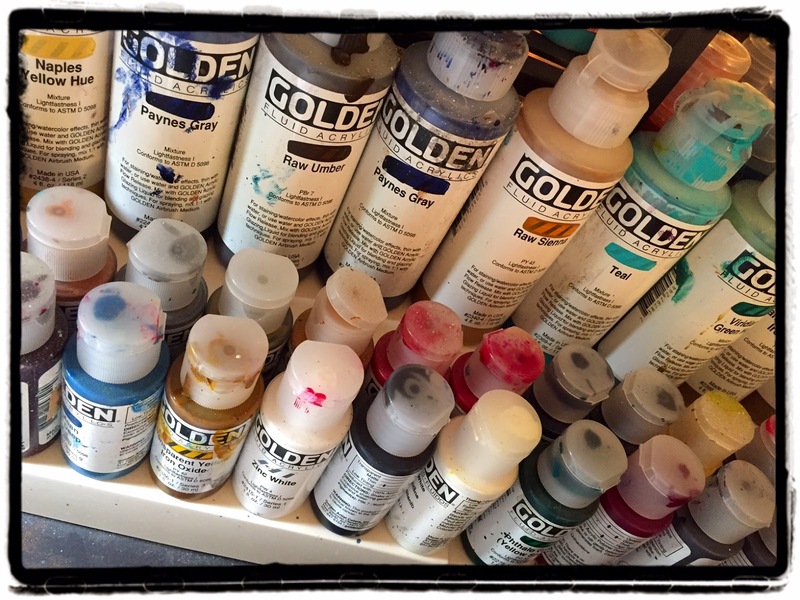 I love Golden Paints and their Fluid Acrylics are one of my go-to supplies -- as evidenced by this picture below. And now I have heard that Golden has released a new product called QoR Modern Watercolors. I have not tried these yet but soon will. And judging by the description, these paints sound like they just might become permanent residents in my studio. 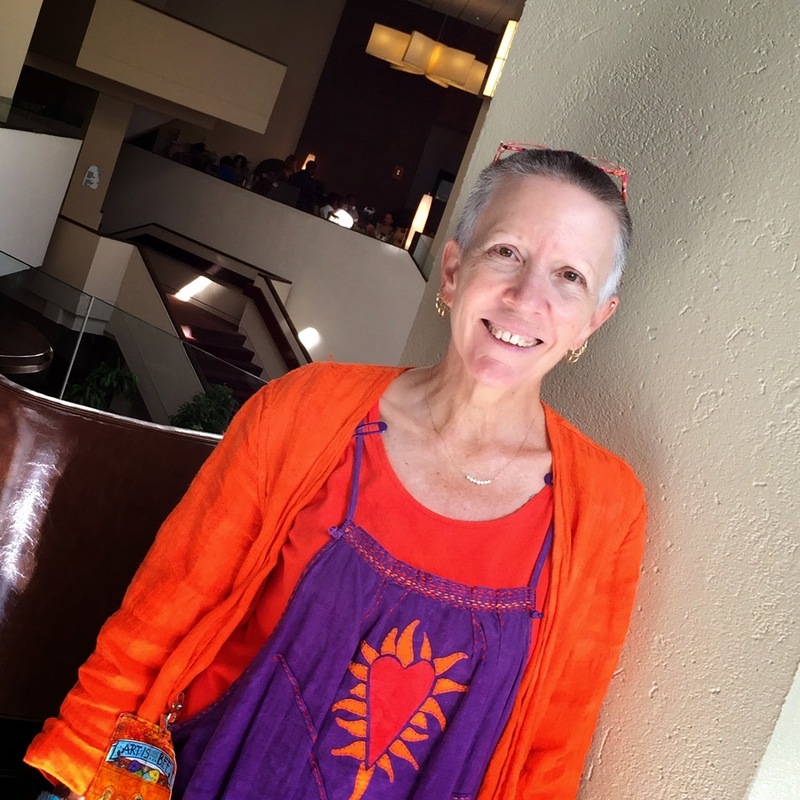 Sally Lynn MacDonald is on the cutting edge of this release and has already prepared an online workshop called enQoRe. Class starts in January 2015 and is based around this new product line. 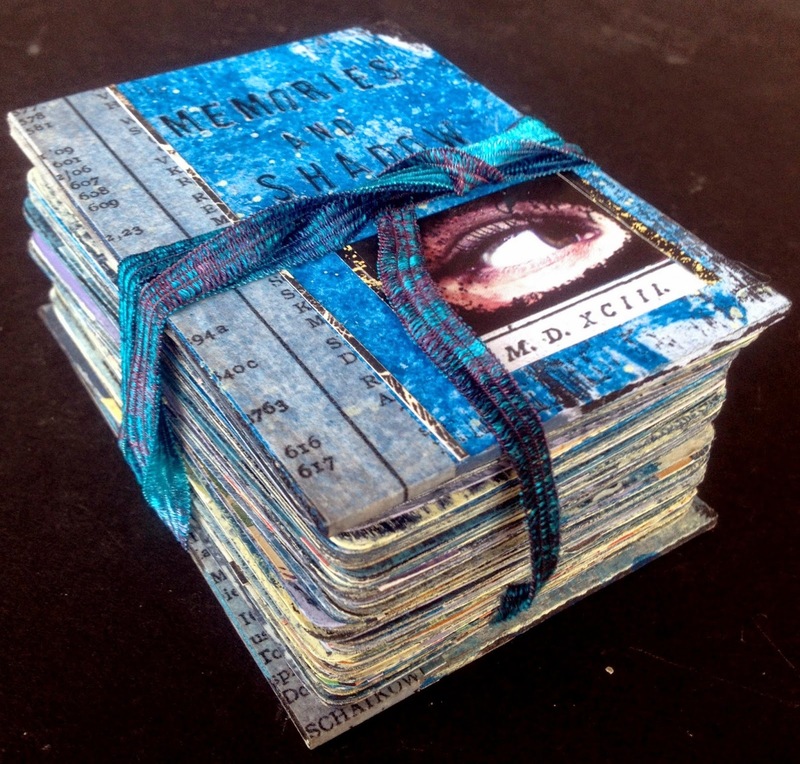 Sally Lynn has generously offered a free "seat" in this online workshop to one lucky reader of The Altered Page. To be eligible for this giveaway, simply leave a comment to this post. Comments will close end of day, Friday October 31st. The random number table will choose the winner and please make sure you leave your email so you can be contacted with registration information if you should win. Good luck to all! Giveaway is now closed. Congratulations to Stephanie, who has already been contacted by email, on winning a seat in Sally Lynn's upcoming workshop. Join me every Sunday when I share some of my favorite links I discovered in the previous week. A different view of "found" objects as prized souvenirs from Stephanie Rosenbloom in the NY Times. 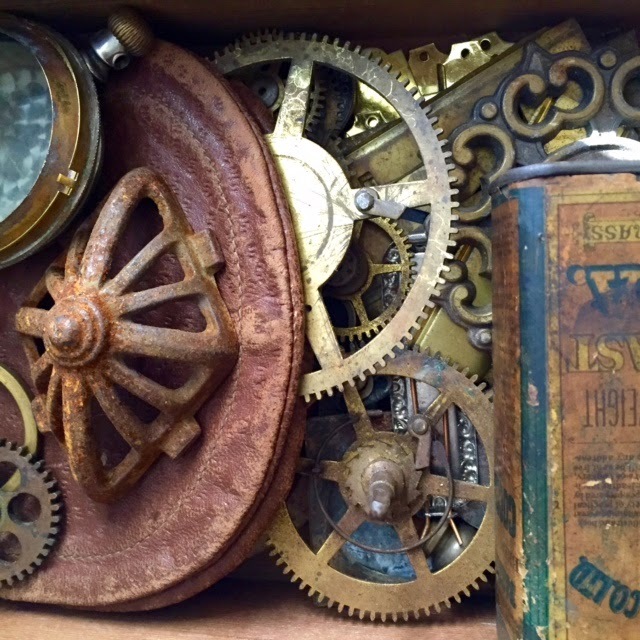 A stunning set of assemblages from Donna Watson. Loving these clever examples of street art by Borondo found on I Need A Guide. Mark Montano has an easy to follow tutorial for making your own paper. 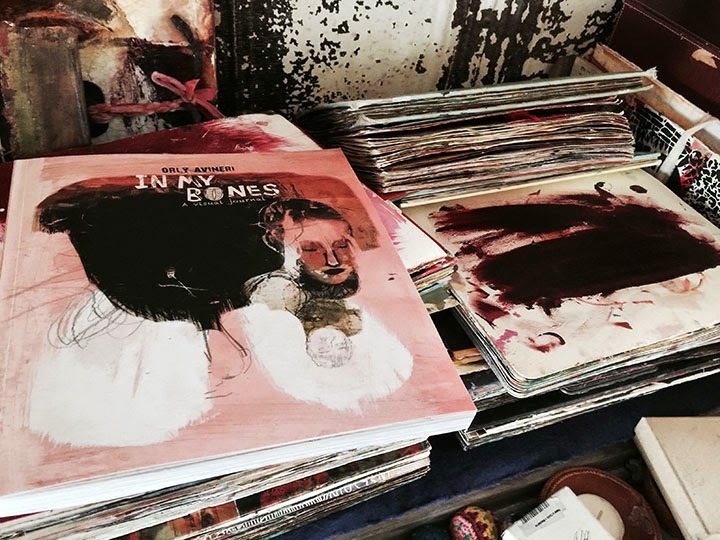 This art journal from Jose Naranja leaves me speechless in the best way possible. 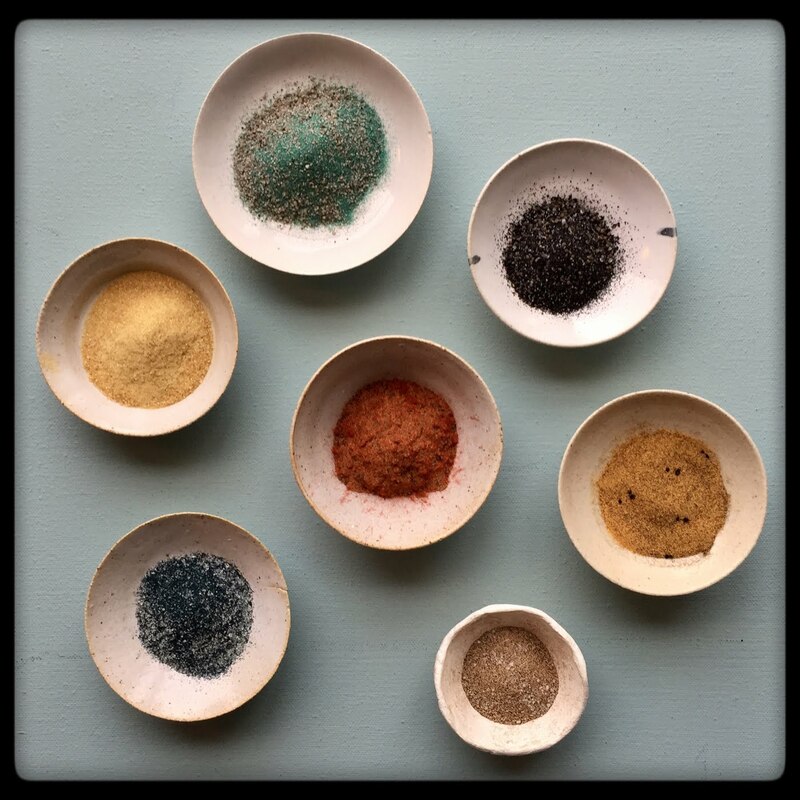 First in a series from Ronda Palazzari: the basics of a paint brush. Grace Bonney shares 10 things she has learned about life from blogging. There is a noise in the distance. It started out as a faint hum but is getting louder and louder. People are taking off the earplugs and setting the noise free. And my hunch is that people are going to continue to turn up the volume. What am I referring to? The sound of authenticity. I have been a blogger for 7+ years. Much has changed on the scene since then. Facebook took over the world. Twitter shortened our voices to 140 characters. Tumblr and Instagram came along and turned our words into images. Pinterest happened and now we are all boarded up. Don't get me wrong...I love and use many of these platforms. But they are very different from traditional blogs. People frequently note that the world presented on these sites is skewed to perfect and beautified. Perhaps too much so. As if the sun is always shining, the house is always clean, and life is always good. Instead of spreading the joy, this message can actually spread envy and distress. Now truthfully, I also often see entries on these platforms that suggest life is far from perfect. But the sense that "the grass is always greener" can seem pervasive. As often happens in life, I think the pendulum is swinging. There is a frustration with this sense of "implied awesomeness" and a movement toward authenticity. And I believe this move is being spearheaded by the blogging community. Just one recent example is the Studio Table, where 120+ chose to share pictures of what their studio spaces really look like -- in all their messy glory. Initially with the flood of microblogging platforms, there seemed to be a shift away from what I term "long-form" blogging. The ease of the newer sites made them very attractive. Many bloggers noted a decline in viewers and, most prominently, comments. When clicking on an upturned thumb is so easy...who has time to actually comment in words? And fill in those annoying Captcha Codes? At the same time, the crew that began blogging in the "early years" were burning out. It takes a lot of time and effort to consistently maintain a blog. A lot! However, I have noticed a shift in the last year or so. Many new people are discovering blogging and again infusing energy into the blog community. 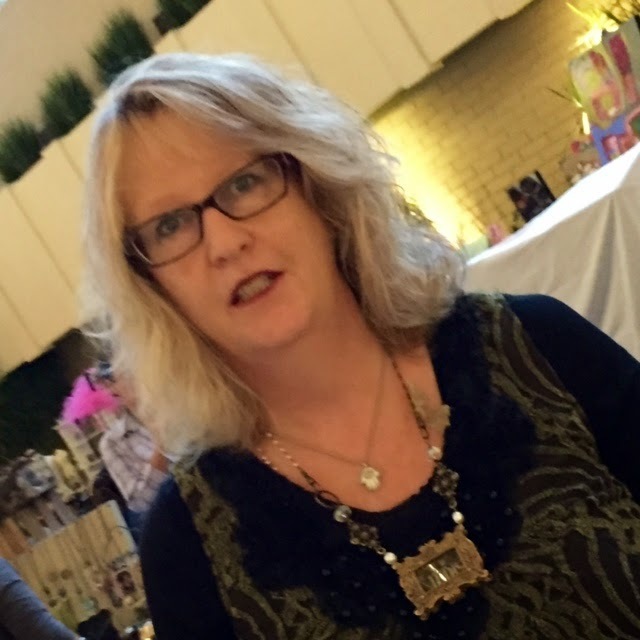 And, happily, many older bloggers have shaken off the dust and have started to blog again. Their newest posts often start with an apology and apparent shock that so much time has past since their last entry. Most importantly, there seems to be more authenticity than ever before in the content (see perfect example here). And for me, authenticity is very attractive and compelling. Real words from real people about real life. 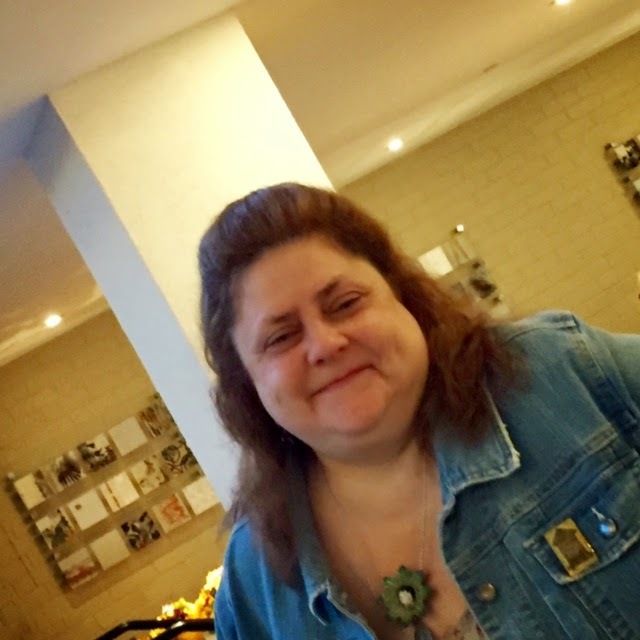 As a blogger, I strive to present an authentic voice in the hopes of continuing to build a community of people who connect to what I am saying and find true value in my blog. 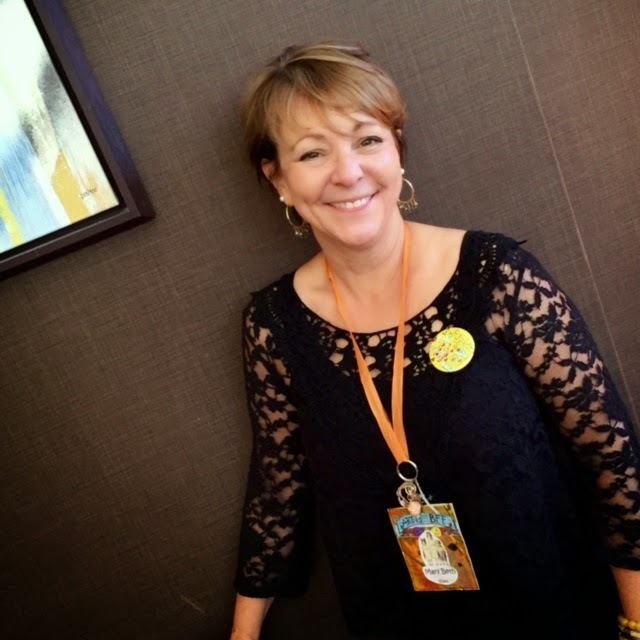 As a blog reader, I seek out the blogs where the voice and personality of the blogger comes through loud and clear -- in an authentic and genuine way. The beauty of blogs is that they can be anything the blogger wants them to be. Every viewer can choose to read through or click past. And when I find authenticity -- I want in! 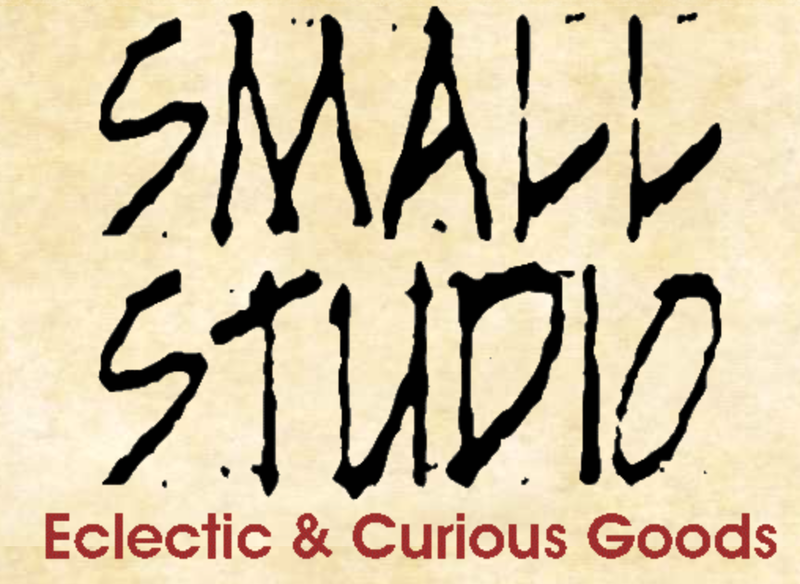 Next month I head to Westlake, Ohio to teach at Small Studio. 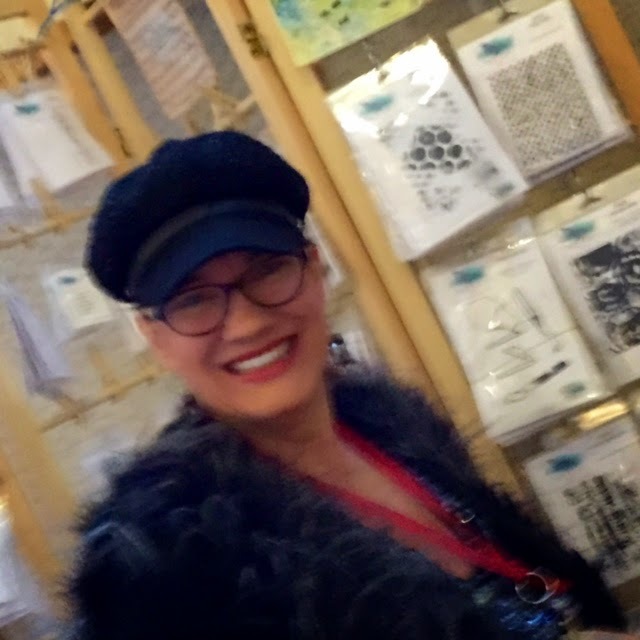 The shop is run by Ginny Carter Smallenburg and I am excited to finally meet her in person after having known her for many years online. There are less than a handful of seats still available and if you are considering joining us there, now would be a good time to register. There are two spots left for Text Tiles, an evening workshop being held on Friday, November 7 from 6-9pm. 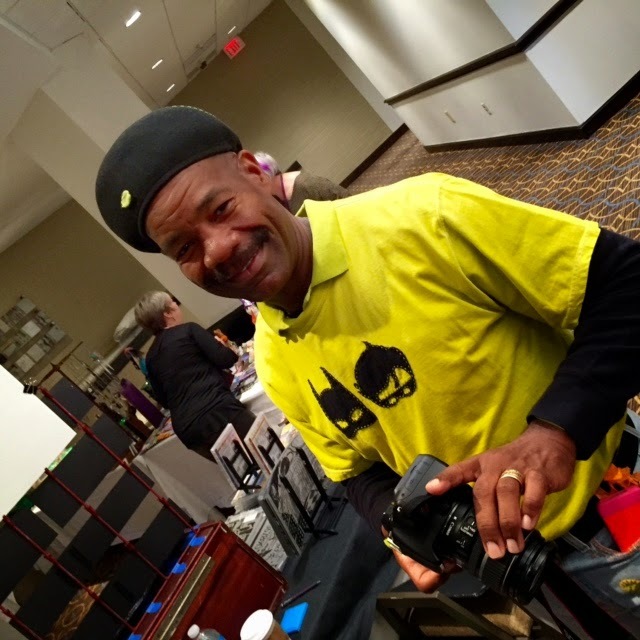 52 Card Pickup, on Saturday, November 8 from 10am-5pm is filled. One seat remains in For Your Eyes Only, being held on Sunday, November 9 from 10am-5pm. 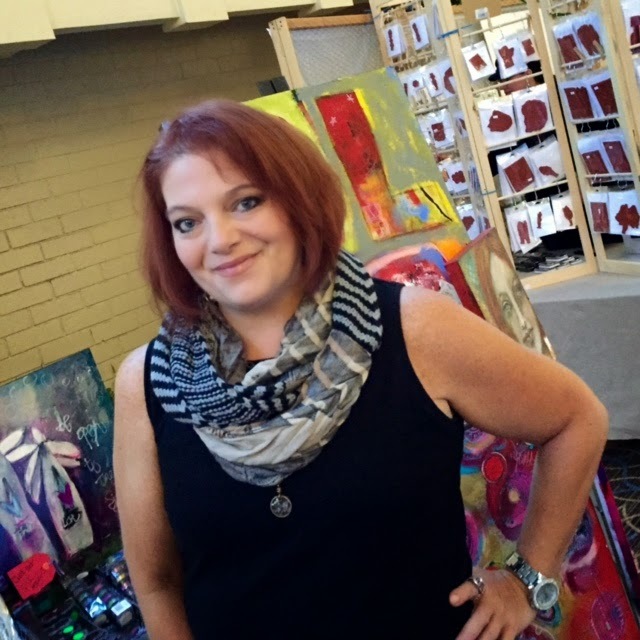 Due to unforseen circumstances, I had to postpone my workshops last weekend at Artistic Artifacts in Alexandria, VA. I am happy to announce that the classes have been rescheduled and registration has been reopened. For Your Eyes Only will now be held on Saturday, January 24. 52 Card Pickup is scheduled for Sunday, January 25. 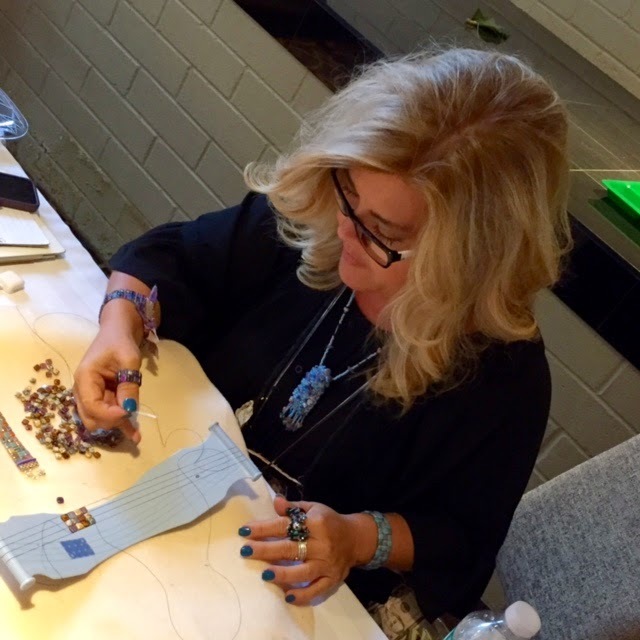 I look forward to two weekends filled with creativity and fun! I am forever fascinated by the fact that when different artists use the same materials to create with, you will never see the same result twice. 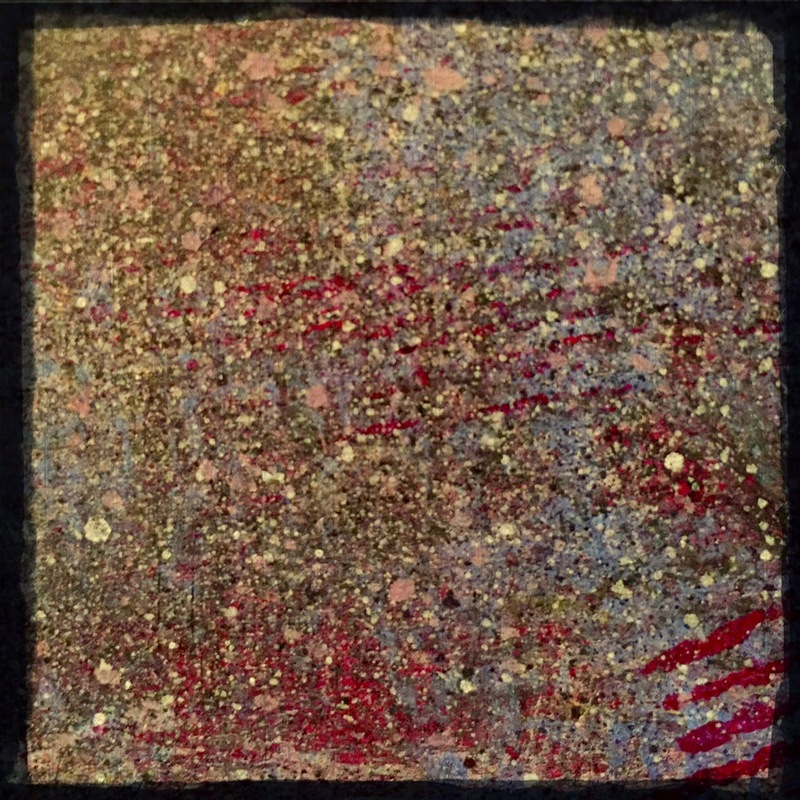 One hundred artists equals one hundred distinct artworks. I often notice this when making the rounds through the Internet and coming across artwork that has been created using the stencils I have designed. I love when other artists come up with ideas that I would never have thought of. A perfect example is Pam Carriker's journal spread. 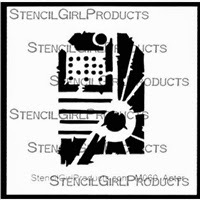 She used stencils from my new StencilGirl Products release, The Urban Collection. 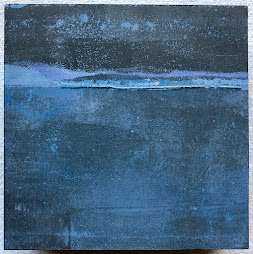 Loving the color palette, which Pam chose from her own, newly released line of paints. I am amazed by the depth and dimension she achieved in this section. Pam used her own line of Liquid Pencil to make both the outlines of the stencils, the writing, and these drips. I do love drips! These stencils were designed to be interactive, with the insides fitting perfectly within the outlines. I love the fact that Pam chose to overlap many of the different designs instead. I am often asked how long it takes me to create a piece of art. I rarely have a good answer to that question, primarily for two reasons. The first is that different artworks take significantly different amounts of time to complete. The second, and probably most relevant reason, is that my process tends to unfold over time. I almost never complete an artwork in one sitting. I tend to work in stages and visit revisit each piece numerous times too many times to count. I often have multiple pieces being hatched simultaneously and enjoy the ability to move from one piece to another. My sense is that this process allows me to avoid artist block. I find that when I step away from what I am working on and come back later, I see the work with a fresh perspective and new eyes. At that point, the pieces speak to me, and I feel ready to move forward. The first four pictures in this post represent backgrounds of works in progress that I will continue to work on. Sometimes this process unfolds over the course of days but usually it is a matter of weeks. 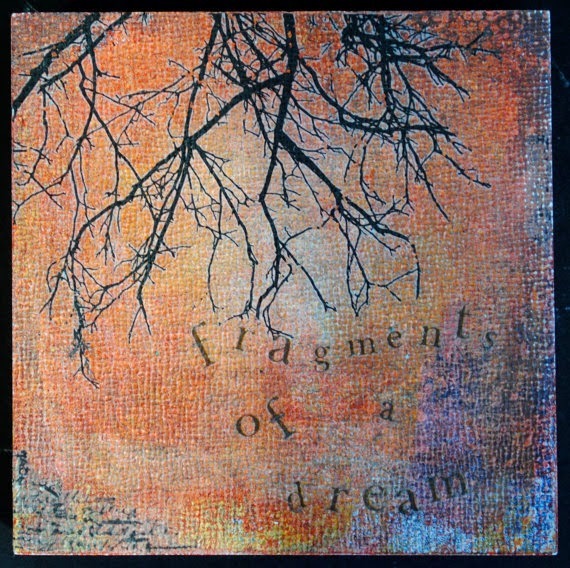 Occasionally, I revisit a work from prior years and know that there is more to do in the present. For example, the following piece was created in a workshop I took well over a year ago taught by Finnabair. But I have recently reworked it and made significant changes to the feel of the piece. As I change over time, so does my reflection in the surface of my work. Love this floating cardboard city sculpture. Found on The Woven Tale Press. Absolutely in love with these cut paper collages from Elise Wehle. Found on I Need a Guide. 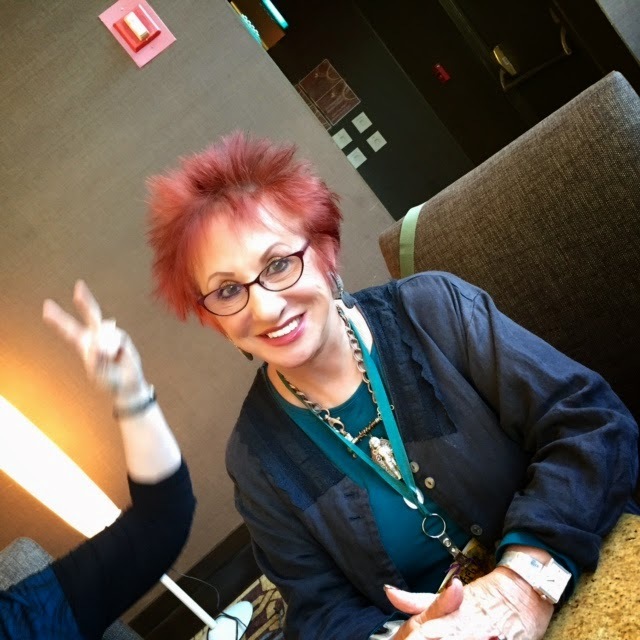 12 great blog topics for artists from Arts Business Institute. Inspiration from Italy. 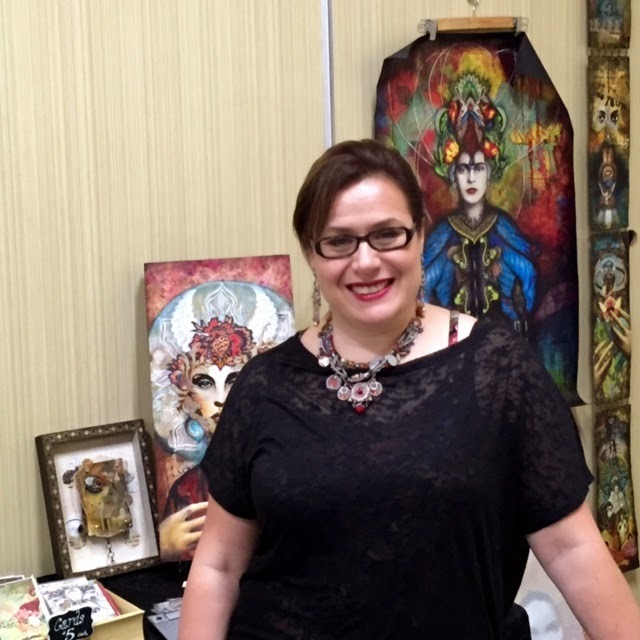 Check out this post from Dorit Elisha about her time working in an art studio in Venice. Anca Gray shares her very (poetic and beautiful) words about dealing with information overload. The diaries of artists through time -- from da Vinci to van Gogh to Haring. 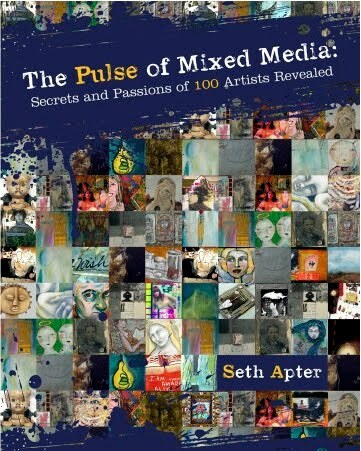 On Huffington Post with the link originally found via the Art Therapy Alliance Daily. A bounty of Japanese textiles in Brooklyn. Via A Continuous Lean. 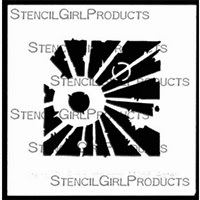 I am thrilled to be releasing the Urban Collection, my third set of stencils with StencilGirl. 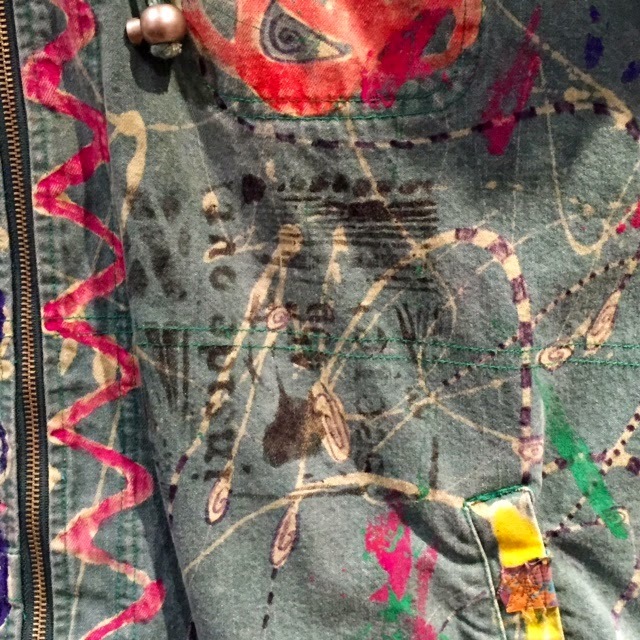 Created with layering and flexibility in mind, these designs capture a New York City urban grunge feel. 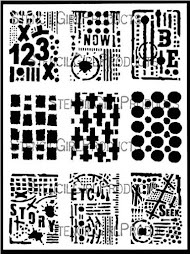 The most exciting thing for me about these stencils is that they are interactive -- they were designed to be used in pairings. 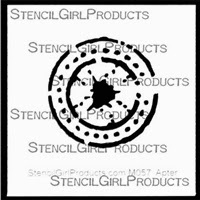 Start with the Urban Outsiders stencil, which measures 9" x 12" and is like getting 5 stencils in one. It includes outlines of a circle, square, star, tag and bar. Each one can be used individually or you can choose to use small sections of each shape for a different look. The fun really begins when you add one of the Urban Insiders to one of the Urban Outsiders. The Insiders were created to fit perfectly inside the Outsiders and consist of designs that match the shapes of the Outsiders. When you use the Insiders with the Outsiders, you get a perfect fit. There are 5 individual Insiders stencils. 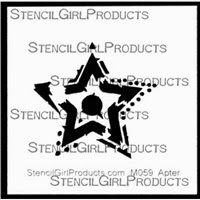 Urban Insiders Circle: one design 4" x 4"
Urban Insiders Star: one design 4" x 4"
Urban Insiders Square: one design 4" x 4"
Urban Insiders Tag: one design 4" x 4"
Urban Insiders Bar: two design 6" x 6"
You can see from the images below how the stencils can be used individually or combined. Who knew that math could be so much fun? 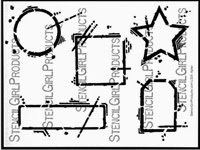 Of course, like all StencilGirl stencils, this set is made using a 7 mil mylar, heat-resistant film. They are strong, transparent and easily cleaned. And they are available now! 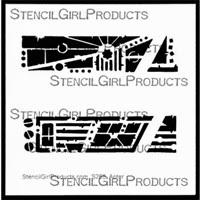 You can purchase these new designs and all my earlier stencils from my online shop or from StencilGirl Products. 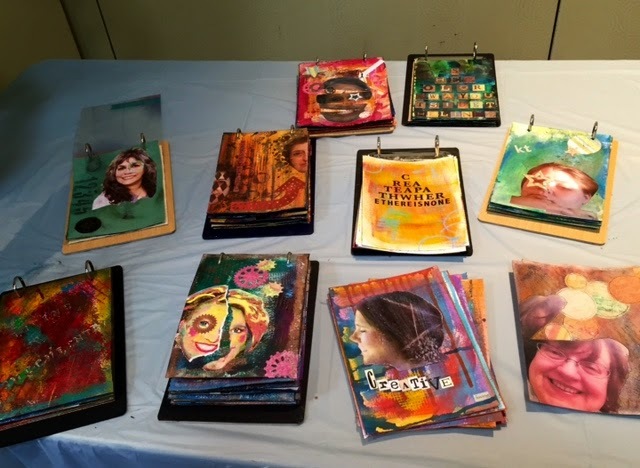 I spent the last four days at the Art is You retreat in Stamford, Connecticut. This is an event that serves up energy and creativity in spades every single year. And 2014 was no exception. I encourage every artist out there to experience a retreat but I realize that not everybody can. Thanks to the Internet, I can bring a bit of the retreat to you! Salliane McClelland and Ellen Legare make it all happen. 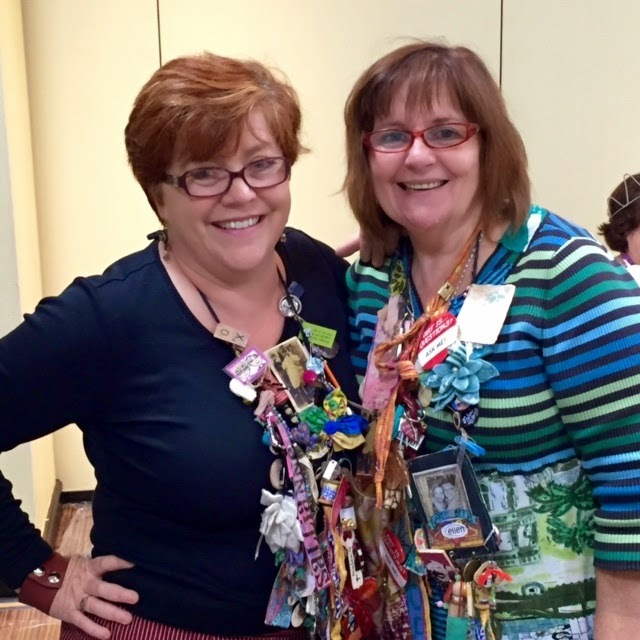 Here they are wearing just a few of the items that the attendees from all the 2014 AIY retreats have made and brought to share. Every day starts out with a different event called the Morning Motivator. 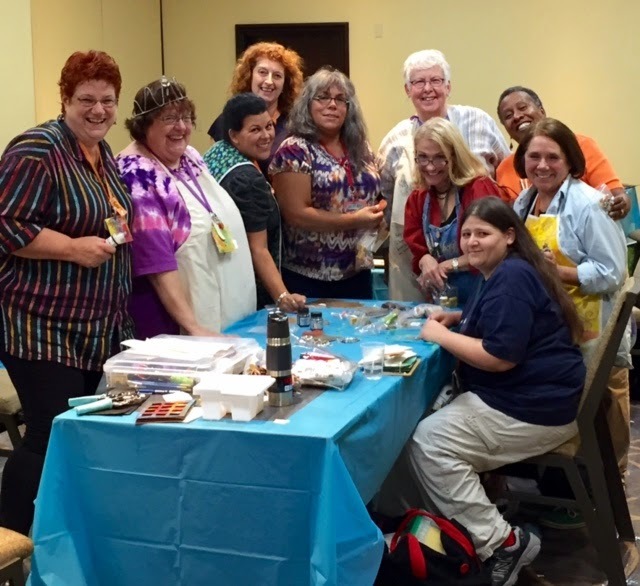 Of course the art workshops are a big part of the retreat. This year I taught one class called iWitness to a very talented, creative and fun group of people. Here are some of the books and pages that they created. 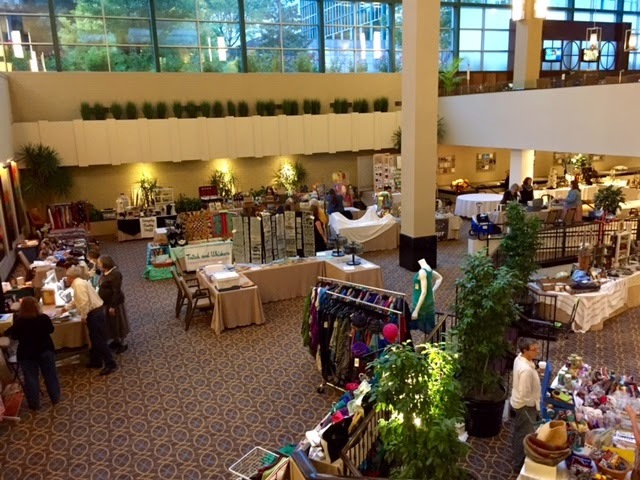 There is also a vending event called the Art Trunk. I had a table there and here is one corner. I also couldn't resist some of the offerings. An extra special moment for me was when I got to reunite with many of the people that I traveled with in Australia just over a month ago as part of the Art is You Mixed Media Roadshow. Happily several people showed me artwork that they created with my stencils. 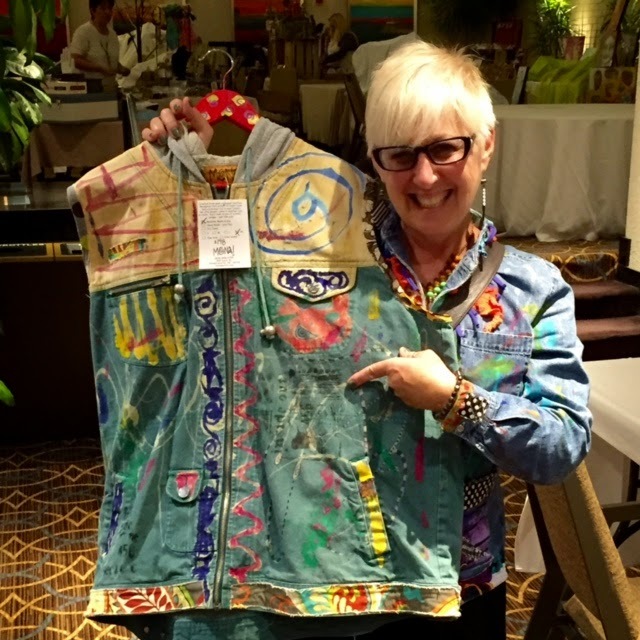 Here Mona Groban used my Inside Out stencil on one of her beautiful items of clothing made from recycled textiles. 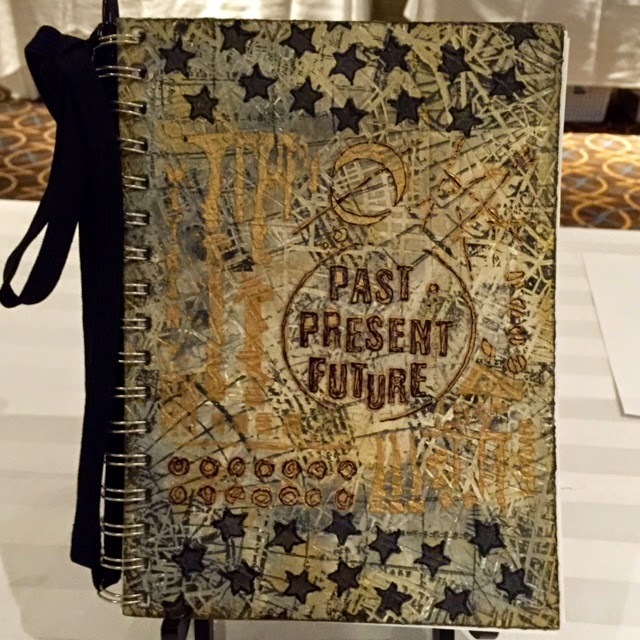 Pamala Young used my Past Present Future stencil to create the cover of a journal that she is sending to our active military personnel through the Journals for Heroes project founded by Edie Malin. 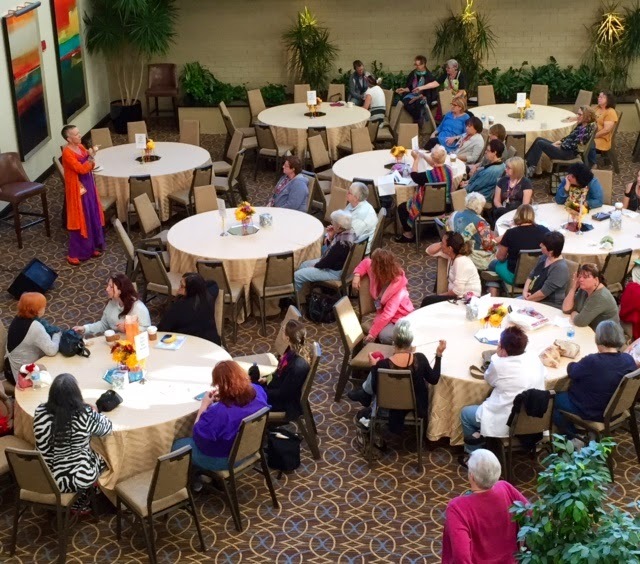 The best part of the retreat for me is connecting with the people who are there as instructors and as attendees. There is nothing like being surrounded by your peeps! I was not able to get photos of every member of the Art is You family but I did manage to get a whole bunch. Talk about an all star crew! 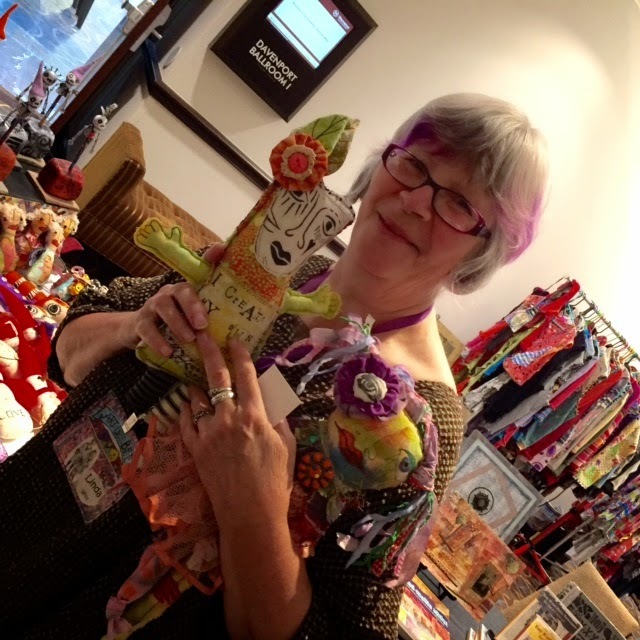 Already looking forward to Art is You 2015, when they will be celebrating their tenth year!